POSH AND BECKS: THEIR LAST CHRISTMAS? 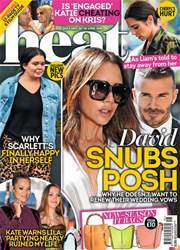 They’ve certainly had their ups and downs since getting together over twenty one years ago, but as David and Victoria Beckham get ready for another family Christmas, we’re told things between the couple have hit a new low. Following on from their awkward appearance at the British Fashion Awards last week – where onlookers said they barely spoke to each other once inside, despite their show of unity on the red carpet – insiders close to the couple tell heat that things are extremely tense after a tough eighteen months, and that Victoria is doing everything she can this festive season to pull them back from the brink.